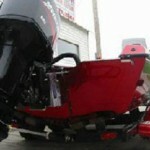 The transom of a power boat is the strongest part of the vessel. It has to transmit the full power of the engine to the rest of the hull, as well as carry the pounding of the hull back to the engine. 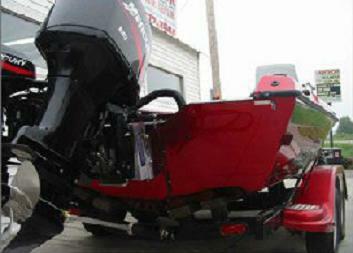 The great forces exerted between the engine and the hull come to a focus at the transom. This is the single most important part of an outboard boat, yet for some reason, it takes more abuse than any other part. Eventually a transom will succumb to its abuse and weaken to the point that your boat is not seaworthy. 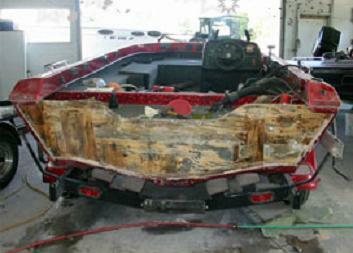 After years of exposure to the elements, almost without fail, fiberglass boats will need a new transom. Even the most stoutly built boat will end up with a rotted out transom core. Rot in a transom may extend to the floors and stringers. They are also likely to be bad. Decide what you will replace, but be ready to discover hidden damage. The transom, floor, and stringers in a boat are, collectively, the most important elements of its construction. Compromising even a single one of the three puts the safety of the vessel and the lives aboard in jeopardy. Every boat is different. Some have curved transoms that require the new core to be laminated to the curvature of the boat. Some boats have splashwells molded in that necessitate separating the hull and deck. Some boats have stringers that may get in the way, or a floor that must be partially removed, or any number of other unforeseen hurdles to get past. This is not a small undertaking. 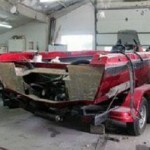 In boat repair circles it is a job for a professional because it is not a “weekend project”, or “one-day fix”. With that said, piecing together a nice transom and deck isn’t a job for the weekend warrior. A good installation is imperative, so you shouldn’t let your brother-in-law do it just to save a few dollars. 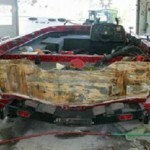 Thankfully, the options available for rebuilding a transom are much greater today than they were many years ago. 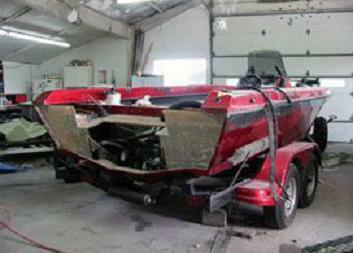 Your boat is not lost if the transom has lost its integrity. We can either strengthen it or replace it altogether. Before you conclude that your boat has seen its last day in the water, contact a Minnesota boat repair and restoration company. It may have many years of life left in it! There is No, magic easy way to do a transom. It’s a nasty job, but done right, it will outlast you. Sorry for the late reply, we don’t always monitor our blog comments like we should. If you would like an estimate on work, please contact us. All of our contact information is on our contact page here. Thanks!